This is my daughter Lilly-Anna. 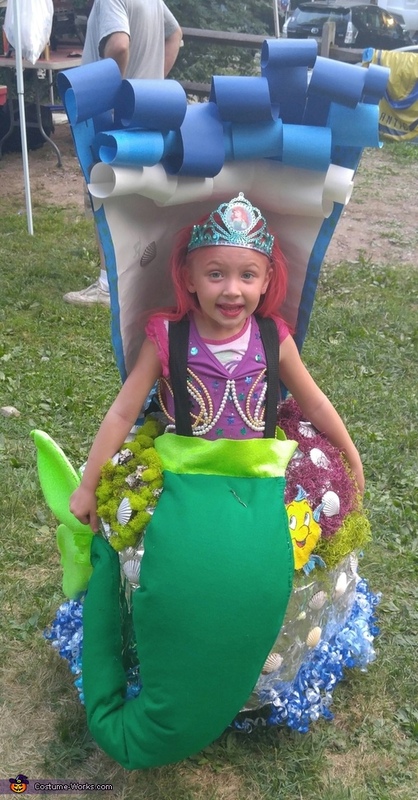 She wanted to be ariel the mermaid for Halloween and instead of just buying an ariel costume I decided to make it. So we started with the rock, the rock is made out of foam bricks held together with glue ($30). Then we took industrial shrink wrap from a local warehouse and wrapped the bricks. Then we took aluminum foil and wraped it up yet again ($10). I then went to a local craft store and bought dark green fabric and light green for the tail ($5). We sewed it in the shape of the tail and stuffed it with pillow stuffing that we had laying around the house. We placed the tail how we wanted it and held it to the rock while my daughters father shoved clothes hanger pieces into it to hold it in place. Her shirt is made from a purple tank top with beads and sequence we bought from the craft store ($10). I sewed the beads on and used superglue for the sequence on. Her hair is her natural hair with spray on, wash out dye. It took 3 cans to make the color in the photo ($9). The shells are from the beach we went to this past summer and are super glued on. The crown we bought at a store in the mall ($6). The moss on the rock is from the local craft store as well ($10). The wave behind her is made from 3 sheets of of poster paper glued together, cut at the tips, and rolled to make the wave form ($5). It is held up with clothes hangers that we straightened out. All together with allvsupplies listed above and superglue this costume cost me roughly $100. But it was worth it and my daughter loves her costume! !